The movie Dark City straddles the line between science fiction and noir genres, with remarkable aplomb. Filmed almost completely under artificial lights, the movie has a beautiful retro, futuristic feel to it. Barring some jarringly anachronistic CG imagery in the final showdown scenes, the movie maintains an honest consistency to noir themes. 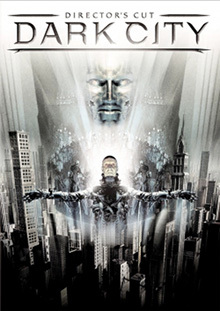 The movie follows the self discovery of a man, who finds himself at the beginning of the movie, with no recollection of who he is or where he came from. And unlike Jason Bourne, he has no special skills other than an unknown power to reshape the entire world around him. John Murdoch (Rufus Sewell) is the blank slate, on which the disturbingly dark world around him essays an interpretation of time and memory. As John begins to understand the nature of his world, he also begins to question the reality of his life - in particular the continuity of time and dependability of memory. The ideas are not necessary novel, but reflected in the light of the vivid stylish world of Dark City, they are immersive. And layered in with the ideas are the characters that appropriately defined with the awkwardness demanded by an artificial existence. Emma Murdoch (Jennifer Connelly) plays the beautiful yet lost wife of John. Dr. Daniel P. Schreber (Kiefer Sutherland) is the link between the world of the humans, and the forces that defines it. Dark City combines the moody feel of noir, with beautiful photography and a thoughtful exploration of the psychology of humanity. There is something in it for the mind and the eyes. All in all, a thoroughly enjoyable flick for those looking for something out of the ordinary.